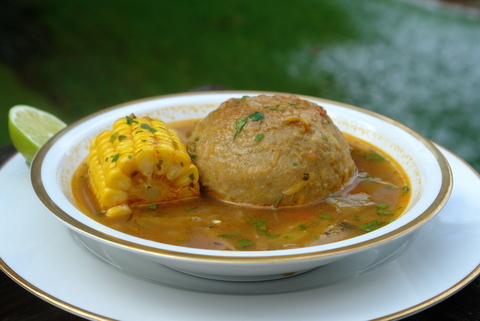 Caldo de bolas or sopa de bolas de verde is a typical soup from the Coastal region in Ecuador; it consists of dumplings or balls made from green plantains and stuffed with meat and vegetables served in a beef broth with corn and yuca. 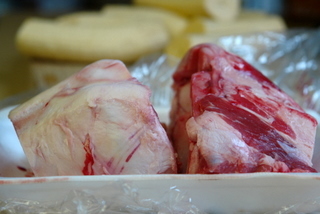 The meat for the dumpling filling is boiled with some beef bones, the green plantains and other vegetables in the broth that will be used for the soup. 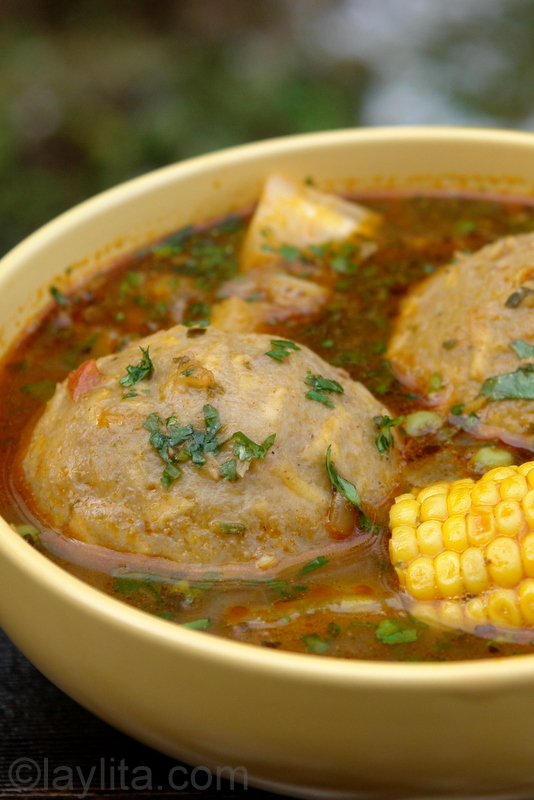 Caldo de bolas de verde is a typical Ecuadorian soup of green plantain balls or dumplings stuffed with meat and served in a delicious broth with corn and yuca. 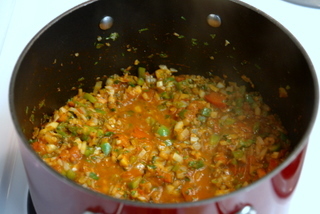 Heat the oil or butter over medium heat in a large pot, make a refrito or base for the broth by adding the diced onions, garlic, tomatoes, bell pepper, cumin, achiote, cilantro, oregano, salt and pepper. Add the 10 cups of water/broth, the beef bones, the meat chunks, and plantains pieces. 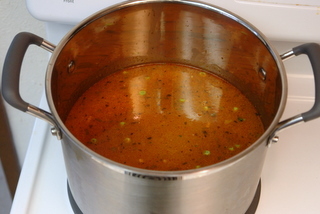 Bring to a boil, reduce temperature and simmer for about 30 minutes. 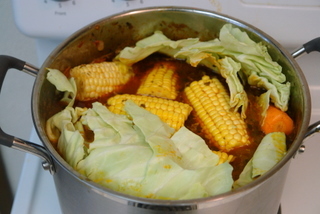 Add the carrots, corn and cabbage, cook for another 15 minutes or until all the ingredients are fully cooked. Remove from the heat and let cool until safe to handle, then remove the bones from the broth and discard them. Remove the meat, carrots, corn and yucas from the broth, leave the plantains in the broth until ready to use them – keeping them in the broth will prevent them from drying out and make it easier to mash them. 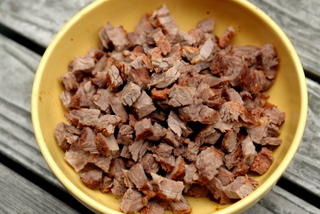 Remove the meat and chop it into very small pieces. Cut the cooked carrots into small pieces. Remove the strings from the yuca and cut them into small bite size pieces. 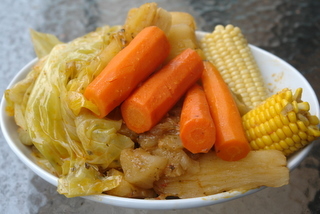 Chop the cooked cabbage and cut the corn in smaller slices; reserve the corn, yuca and cabbage for later. To make the meat filling for the green banana balls or dumplings make a refrito or base by heating the butter or oil over medium heat, add the onions, tomatoes, garlic, peppers, cumin, achiote and salt. 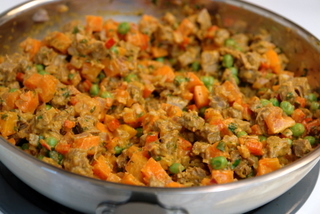 Add the chopped meat, carrots, peas and cilantro. 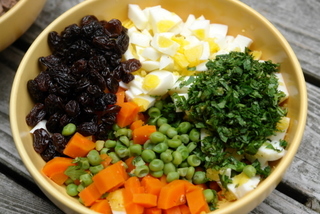 Mix in the peanut butter and 4 tbs of the broth, as well as the raisins and hard boiled eggs if using, mix all the ingredients well and save the filling until needed. 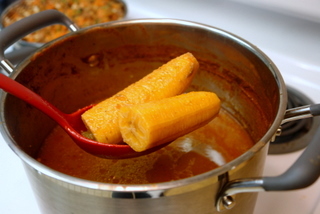 Meanwhile remove the plantains from the broth and mix them in the food processor until a sticky dough is obtained. 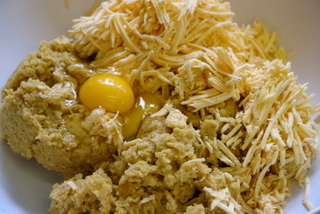 Mix the cooked plantain dough with the grated raw plantains, the eggs and some salt and pepper, you can either mix these by hand or in the food processor. 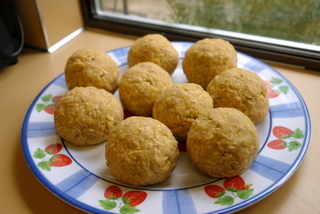 Using your hands, try to keep them wet or lightly greased, form the plantain dough into medium to large sized balls, stuff each one with a generous spoonful or two of the meat filling. Strain the broth and return to the heat until it boils, reduce to a simmer and add the dumplings, cook over low heat for about 10-15 minutes, be very careful not to stir the soup to avoid breaking the dumplings. Using a ladle remove the dumplings from the soup and place them on a plate. Add the chopped yuca, chopped cabbage, corn slices and any leftover filling back to the broth, cook until all the ingredients are re-warmed. 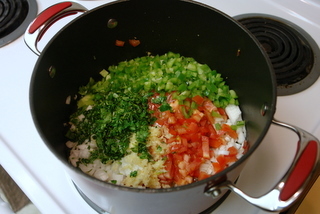 Add the finely chopped cilantro to the broth. 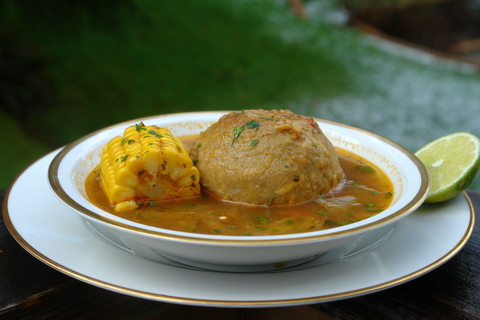 Place a green plantain dumpling or two in each bowl; add a ladleful of broth with yuca, cabbage and corn. Serve with lime slices, aji and pickled onions. I had this soup for the first in Guayaquil, I was still in high school but was spending a few weeks in Guayaquil with a friend to work at the Feria de Duran (a huge international fair), we had an interview at a cosmetics company and after the interview (and confirming that we got the job) the owners of the company took us to have lunch, on the way to the restaurant they couldn’t stop talking about how great the caldo de bolas was at this place so of course everyone had it, and it was so good, the green plantain dumpling and the filling were so tasty and the broth was also full of so much flavor. You know how sometimes when you eat something new for the first time and it is so great that from then on you compare that dish to all the subsequent versions of that dish and it feels like the greatness of the original dish will never be matched? Well, that’s exactly how I felt about this soup, and all the times that I’ve tried to recreate the caldo de bolas I always try to remember the flavors of the first time I tasted it. While you can occasionally find this soup in the Highlands or Sierra region of Ecuador, the best one is the one that you will eat in Guayaquil or other cities in the Coast. The recipe for this soup has been one of the most requested and it has taken me long time to post it, I’ve made it several times the last year, each time trying to get it closer to the way it tasted the first time I had it. Getting the flavors right has been the easier part, the hardest part was getting the green plantain balls or dumplings to stay in one piece, they are very fragile and need some care to make sure they don’t break apart while they are cooking. I started out by making the dumpling dough using a masher but the plantain dough came out very chunky so the next time I used the food processor and the result was a lot better (and faster), but even then the dumplings were still too delicate and I had a few that didn’t “survive” (i.e. they disintegrated partly into the broth), so I tried adding a couple of eggs to the dough to help keep it glued a little bit and that seemed to help a lot. 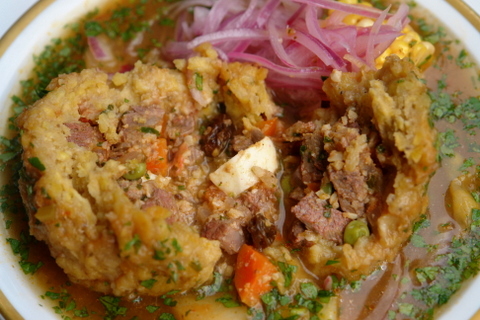 The filling for the dumplings consists of a mix of the beef and carrots cooked in the broth, as well as a refrito (or base) made with onions, garlic, pepper, tomatoes, spices, peanut butter, cilantro, raisins and hard boiled eggs. Nicolas – the husband – wasn’t too fond of the raisins and hard boiled eggs, so sometimes (if I’m being nice) I will leave those out; you can choose to add them or not based on your preference. I also tried different versions of the filling using ground roasted peanuts vs. peanut butter and I liked the peanut butter more, plus it is more convenient to use peanut butter instead of roasting and grinding the peanuts. For the beef broth the first step is to make a refrito or base, I tried making the refrito two different ways, the first was to combine all the ingredients for the refrito – onion, pepper, tomato, garlic and herbs – in a blender and then mix with the spices and water/broth and bring this mix to a boil. The second method was to chop or dice all the vegetables and sauté them over medium heat with some oil or butter as well as the spices, then add the water/broth. Both methods worked well, the first is very easy and saves a lot of chopping, it also makes it easier to strain the broth once it is done; with the second method I like the flavor that the broth gets from sautéing all the ingredients together. 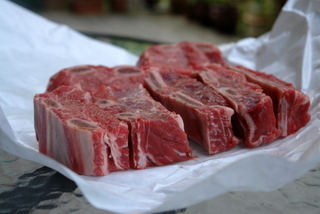 Another part of the broth that I experimented with was using meat with bones (such as short ribs) or using just bones plus boneless stew meat, I found that using a couple of large bones (with minimal meat on them) plus the boneless meat worked better. The bones really flavored the broth nicely and I didn’t have to deal with pulling the meat off the bones, just chopping up the chunks of meat. Finally, I also tried making the broth with just water or using a combination of water plus boxed broth (vegetable or beef) and there wasn’t a huge difference, in fact I thought that just using water when making the broth with the bones gave the broth a more natural flavor. After the dumplings are assembled and the broth is strained you need to re-heat the broth, reduce the temperature and add the dumplings very carefully, do not stir the soup at all and keep it from boiling or the dumplings will break. 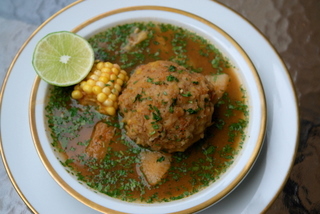 The first time I made the mistake of adding the chopped yuca, corn and cabbage back to the broth and then adding the dumplings, this resulted in a few of them breaking, so it is best to have only the broth in the pot when cooking the dumplings. 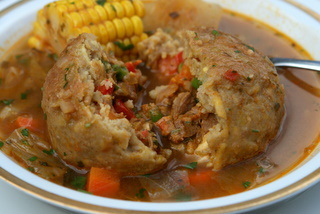 Then you can remove the dumplings and add the chopped ingredients (plus any leftover meat filling) to the broth, then serve the soup by putting one or two dumplings in each bowl and adding the broth with some yuca and corn. If the soup is going to be a starter course you’ll probably want to add just one green plantain dumpling, however if the soup is the main meal you should serve two dumplings in each bowl, of course it also depends on the size of the dumplings, you can make them smaller (golf ball sized) or larger (tennis ball or softball sized) based on your preference. 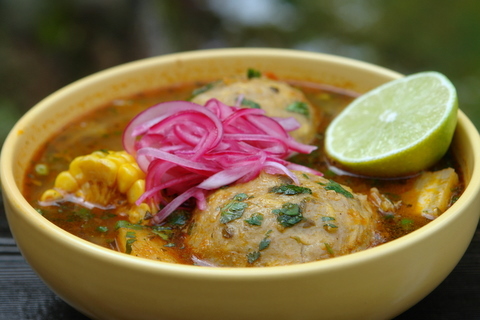 I serve this soup with a slice of lime, some cebollas encurtidas or red pickled onions and some hot sauce on the side. This recipe is amazing, my abuelita also made amazing caldo de bola. I made a mistake though, when I placed the bolas I did not wait for a boil first, so I decided to keep them in a little longer and majority disintegrated on me =[. The soup was still delicious though! next time I will remember my mistake lol. This was amazing, made it today for the first time (even though we have been eating it for years). We are stuck in the U.S. for a couple of years and this is my husband’s favorite dish. It is labor intensive, but worth every second!! Only two of my bolitas exploded, and not even all the way – so it was a success! Thanks so much for your website, it is wonderful. We did llapingachos last week, with churrasco. So good. Gracias! My friend’s mom makes this once a year. Better than what I had in Ecuador. Yes it is that good. Before I die I will learn to make this. Love your website I tried almost all the recepis my husband is from Ecuador. 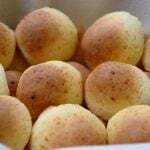 The only problem I have when making de bolas the came out too sticky and can not do anything with them I fallow recipe but still can’t get my bolas the right consistence. Any ideas ? 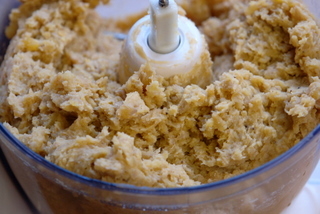 Hi Ana – The plantain dough can get too sticky if it’s overmixed in the food processor. 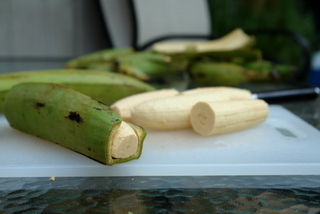 It should be sticky, but will get smoother as you mix it with the grated raw plantains and the eggs – it does help to this last part by hand. It also helps make the dough smoother to add a little bit of oil or rub your hands with oil as you mix it. Me encanta este caldo Lay!!!!!!!!!!!!!!!!!….. Thank you for this recipe!!!! I love all your recipes. What do you recommend to use instead of peanut butter. We are allergic. And can ground turkey be used instead of lamb? You can just leave the peanut butter out or use an alternate nut butter that you aren’t allergic to. Any kind of meat (or seafood or just vegetables) can be used instead of the beef. This is a soup that is on my bucket list to make. I just want you to know how much I admire your work. Hi Norma – Thank you! I love your site also! This was yummy but so time consuming. I had my mother help me and we were both tired after lol. This is my favorite soup. The pictures are great. hola mil gracias por la receta aunque soy de Ecuadro no la sabia hacer ahora vivo en California y hoy lo hice junto ocon mi hermano la sopa de bola de verde nos salio rica y le pude dar a mi vecina americana que le gusto mucho gracias!!!!!!!!!!!!! voy a tratar las demas recetas y le digo como me queda ok?? mil gracias por la ayuda que nos brindan! can’t wait ti try it … look’s sooooo good. Can I make the dumplings ahead and freeze them? Yes – you can do that. I usually makes the balls filled with cheese….but I like this recipe much better….I got some tips from you…thanks very much…This is one of my family favorite soup…I’m pretty sure, yours will be a great success when I serve it to them….yummy!!!! Que riiiiico! Thanks for posting this! I’ve been looking for the recipe for a while now. You’ve done a marvelous job of breaking the steps down! 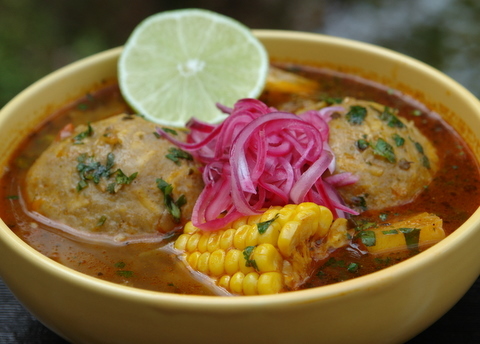 I found your site because I am having Sopa de bolas for lunch today and I wanted to show one of my co-workers a recipe. My mom is from Ecuador and made my soup, but her recipe is very different. She uses chicken broth, cabbage and potatoes for the soup and stuffs the bolas with farmer’s cheese. For the bola dough, she precooks half of the plantain. She used to use a grater to mash up the plantain, but this time she used a food processor. She does use egg to bind the dough. I’ve noticed her recipes often differ from what I find online or see on tv. I don’t know if it is because she is from the mountains, if she changed her recipes to what was available here in the US or if the cuisine has changed that much since she left Ecuador in ’68. I teach a “Hispanic Cultures” class in Cameroon, and among studying a bit of language, folktales, music, and other cultural products, practices, and perspectives, we cook together once every two weeks. I was thinking about trying bolas de verde with the students, but because of all the steps, I think I’ll save it for a dinner with friends. Perhaps we’ll make some patacones–I tried that recipe a couple weeks ago and they were delicious. Really, is there anything better than twice-fried plantain? 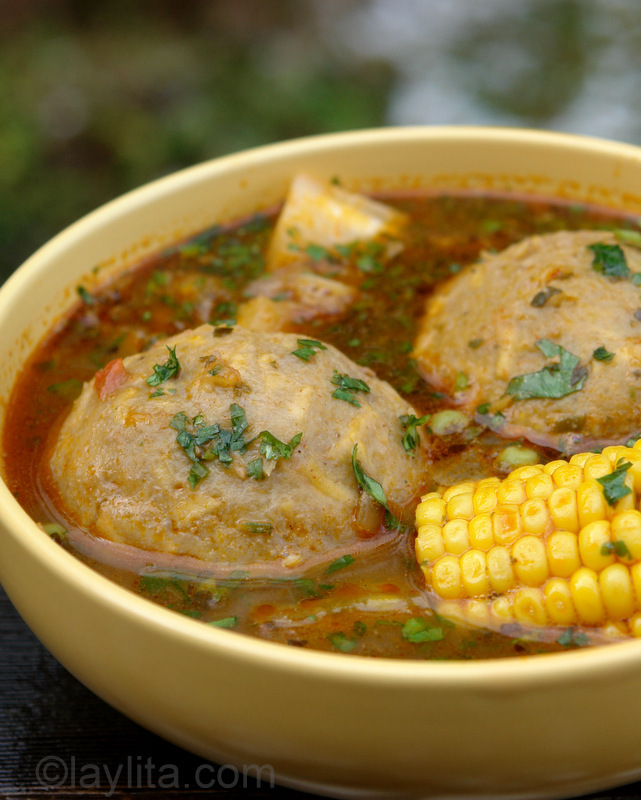 I had the Caldo de bolas for the first time yesterday and loved it. Actually had the leftovers for my lunch just now. This soup is so delicious. Thanks for the recipe. Looks a bit tricky, but I will try to make it myself. The Quinoa soup sounds delicious also. Hice esta receta y me quedó riquísima a mi esposo y a mi hijo les encantó, lo que significa que realmente es buena!. El único inconveniente es que me tomó 3 horas hacerla, pero valió la pena. Amo este blog! This is a great recipe! 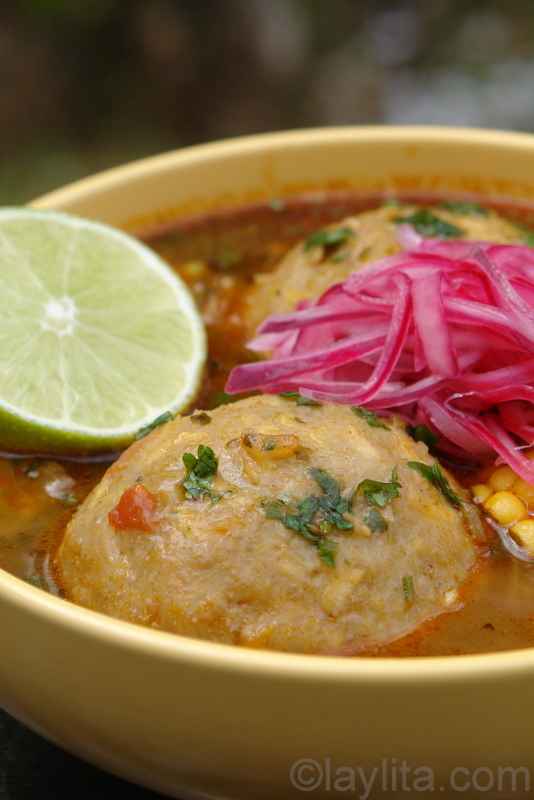 We add peanut butter, sometimes a little olive oil, and some broth to the masa for the bolas. This adds flavor, and helps the balls to stay together. My mamita is from querido Ecuador, and she doesn’t make this soup. She says it is too much work! :) I love to cook, so I make it for her. She loves it! Thanks for such a great site! I have been following laylita and tried many of her recipes. 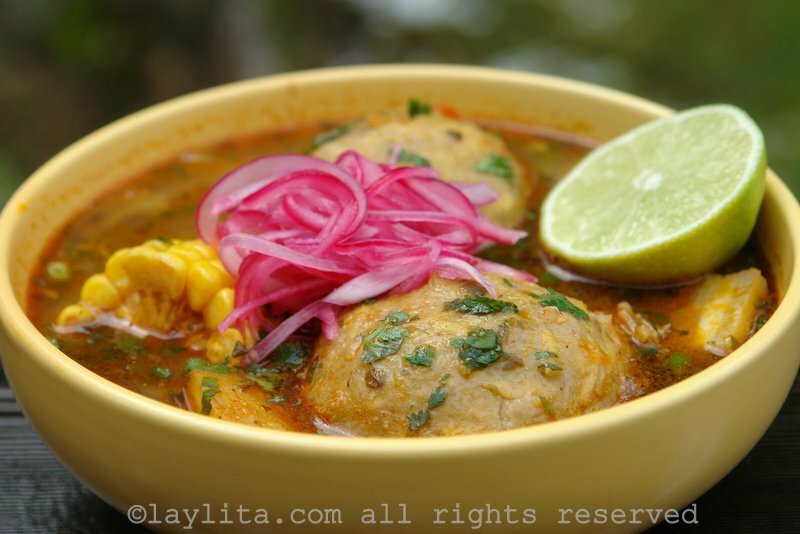 Caldo de bolas has always been on my list but I’ve been scared to make it! I’ve heard it’s a very hard recipe and requires a lot of time. Finally, I made this soup yesterday and it came out delicious!!! Laylita’s recipes were fantastic. It took almost 4 hours to make this soup – from preparation to serving time but it was fun and worth the wait. * I made the plantain dough with food processor (THANK GOODNESS). Make sure to cover as you are making each one of them to prevent the dough from drying. Laylita also recommended to wet your hands as you are making the bolas to prevent the dough from sticking on your hands – that was very helpful! 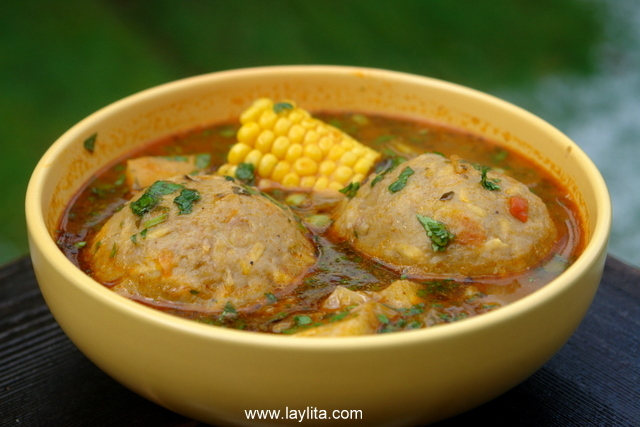 **Once you make the bolas, let it sit for about 7 minutes to let it stiff before putting the “bolas” in the soup. This was very helpful for me to make sure that the bolas does not break while boiling in the soup. *** i had lots of left over meat filing! I guess next time, I’ll add more plantains to make enough balls. For now, I’m going to empanadas with the leftover filing! Con un suspiro de nostalgia de mis buenos tiempos en Ecuador – thanks so much for the opportunity to remember my heritage, my family and my many vacations in Ecuador with these wonderful recipes. I fear my children, 3rd generation and only half ecuadorean, will not have the chance to enjoy Ecuador’s beautiful culture and food. At least now I can give them a small taste! and…hey- I LOVED eating from the street carts – or better yet, buying from the vendors on the bus! Hola! como estas? my name is Roxanna i was born in NY and raise in my parent native country until i was 11 yo, can you guess where? if you guessed Ecuador, then you are right! i was raised in Guayaquil more specifically, i came back to NY with my family in 1994 and been here ever since. 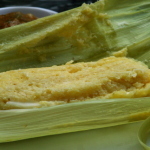 i just wanted to stop by and say how good it is to see some of the classic Ecuadorian dishes online! Last night all I kept thinking, “I need to get the receta of caldo the bola”. Thanks for providing pictures of the step by step process. I love all kinds of food, but this reminds me of sancocho, a hearty soup from the Dominican Republic. I’m going to make it on Sunday for my family as a surprise. Thanks once again. Can I just say that you have one lucky husband!?! I accidentally ran into your website while searching for an humita recipe. I was delighted to find so many of the traditional dishes that I have grown up with. My mother is a great cook however; there are certain dishes which she won’t venture into making due to lack of know how (humitas being one of them). Although I came here when I was 5 I can still recall the wonderful aromas coming from my grandmother’s kitchen and also from my mother’s growing up. I have tried following my mother’s recipes but it’s difficult because she works from memory and I from recipes. I tried your humita recipe and they came out great for being the first time; I will be making them again soon but with a different cheese. 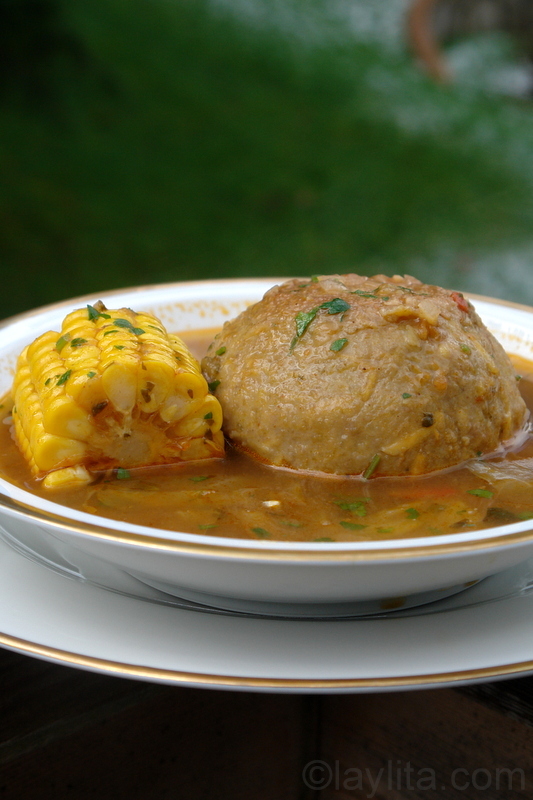 I will be making the caldo de bolas tomorrow for my mother and hopefully I will make her proud of my attempt in reconnecting with my Ecuadorian culinary roots. My parents are Ecuadorian so I group on this and LOVE it. Thanks for the recipe!!! My parents are no longer with me and I never thought to ask about the recipe! Jemina -Enjoy the caldo de bolas. I love Condorito! I am going to attempt to make this dish tonight. My mother n law is an expert and yours looks very close to hers. I made it once and it was tastey but the balls were not firm enough. 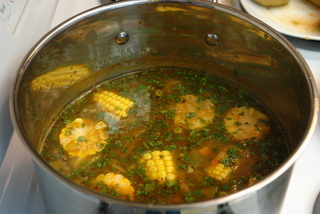 My father had a friend from Ecuador, and he would often bring a huge pot of this fantastic soup to our house. My Cuban family had never before tried this particular combination of flavors, although we often served plantain as a side dish. My father’s friend moved away and I forgot about the soup — the last time I had it I was app. 9 or 10 years old (I’m now in my late 40s). I am sooo happy that my google search for plantain recipes yielded this web site. 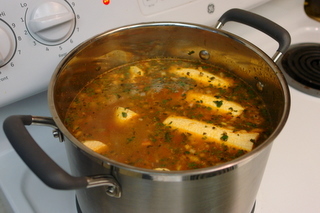 I hope to make this soup this weekend and will certainly be back to look at the other recipes. Muchisimas gracias!! Laylita gracias por la receta. Yo no soy muy buena en la cocina y mis recetas eran bastantes limitadas, pero le cuento que prepare el caldo de bolas y me quedo exquisito, fue la primera vez que lo hice y no lo parecia. Me felicitaron por el sabor y la decoracion del plato. Gracias por esta pagina de recetas Ecuatorianas, me hace sentir muy orgullosa de compartir esta pagina con otras amistades de otros paises para que ellos puedan apreciar nuestra comida y tambien elaborar nuestros platos tipicos. Thank you for this website. 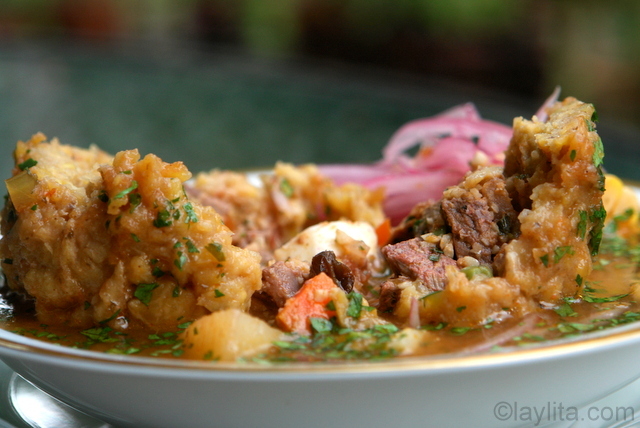 I was looking for the recipe of Ecuadorian caldo de pata and stumbled upon this website. What a very rewarding search – I did not find the recipe I was looking for but found instead a treasure of latin food recipes, with easy to follow instructions and colorful photos. 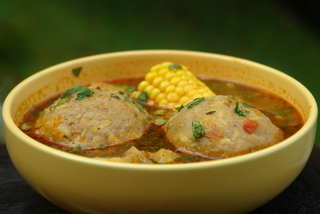 I was inspired to cook caldo de bolas, I have not seen or tasted it at all, thus the photos really helped a lot. 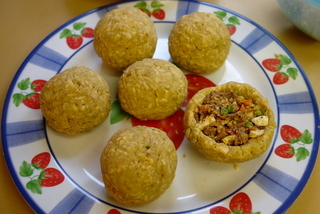 However, for the plantain dumpling, I omitted the egg, and used grated cassava instead of grated green plantain, — the plantain balls held their shape very well and did not break at all. Thank you for sharing the recipe for this wonderful dish. Hi Alembong – Thank you for visiting and for your comment! I just made caldo de pata last month and need to post it, I will try to do so in July. Thank you Laylita, yes I saw your recipe for caldo de pata. We are having a really wonderful sunny and refreshingly cool weather today here in Toronto, I shall use your recipe to make caldo de pata for dinner tonight and that should ‘make our day’. Cheers! Oh wow this looks amazing, I would love to have a BIG bowl right now. Glad I found your site, very nice..
how are you? I am from Ecuador is this is my favorite dish, my mom used to make it for us but i never learned to cook from her and now she lives so far away. anyways i love this soup but it looks pretty intimidating to me and also there are lots of ingredients and steps. I am not the best or experienced cook so i was wondering is there a shorter version to this recipe? I love everything you do and every week i make my grocery list based on one of your new recipes. I missed out on this particular recipe though because it terrifies me. Any advise for a non-cooker? 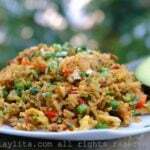 I am from Dominican Republic but I enjoy the Ecuatorian food very much. Today I am preparing la Sopade Bolon de Verde. It does look so good. Thank you! I am from Ecuador and I am looking forward to making many of your recipes. Everything looks amazing! That looks and sounds so tasty. Thank you so much for sharing. Another dish of yours we can’t wait to try. Laylita este plato es uno de mis favoritos aunque cuesta mucho preparalo espero con ancias que las pongas en español para poder prepararla un beso y me encantan tus recetas ya e echo unas cuantas y no me an salido nada mal. Being from Ecuador (Ambato and Quito) and seeing all these dishes is amazing! It’s great to know the various dishes that are from Ecuador, plus your recipe’s and techniques are fantastic. Keep up the great work. This recipe looks fantastic! Ever since my stay in Ecuador in 2005 I have been trying to recreate all the dishes that I ate in Quito, Tena, Atacames, y Quinche. Bolon de Verde con aji, Nescafe, and jugo de tomate de arbol were pretty much my breakfast staples. I didn’t end up having this particular Caldo, but I will certainly try it (in addition to all your other South American recetas you’ve posted!) Now… if only I can find where to get chochos in Kansas City I can make a proper aji! Gracias!!!! This is the very first meal that I ever ate in Guayaquil,no kidding ! I got off of a plane from Quito with my two children(aged 4 and 15 months at the time) in the middle of one of those horrible downpours of El Nino in 1998. I was exhausted and miserable and spoke very few words of Spanish. As soon as I arrived at my husband’s grandmother’s home, she sat me down at the table and placed a steaming bowl of Sopa de bolla de verde in front of me. It was like manna from heaven – pure comfort food ! Now I know how to make it – thanks! OMG…this looks soooo good!! I have to try this soup! soy de ecuador y este es mi plato favorito, gracias por la receta!!!!! This looks wonderful and, as usual, it’s beautifully presented for your readers! Looks ver good. Looks like an elaborate process. We make something similar with minced goat. MIIIIIIIIIILGRACIAS por poner esta receta! ME ENCANTA! Thank you! I was looking forward to this one!! It looks great! I cannot wait to try this on my family!! This soup looks so tasty, hearty and delicious!